Many of us have deceived ourselves into thinking we can. A couple of months ago, we were shocked to learn that Robin Williams took his own life. In his case, many of us joined in a common display of solidarity and grief over the loss of a beloved comedian and actor. Someone who was gifted with the power to make us laugh throughout the years. With his lighthearted humor and whimsical ways, he temporarily eased our own pain and suffering. Even more, he unwittingly succeeded in contributing to the illusion that if we would only put on a happy face and pretend that all is right with the world, it magically would be. Or so we thought. And so we wanted to believe. And we tried. Because people like Robin Williams showed us it seemed possible. After all, they appeared to have succeeded in doing it themselves. Only in the end in a tragic twist of fate, did we find out the truth; that so often laughter was mostly a lie that became the mask that hid the tears of our beloved clown. Too great of a price to pay in my heart and mind…. 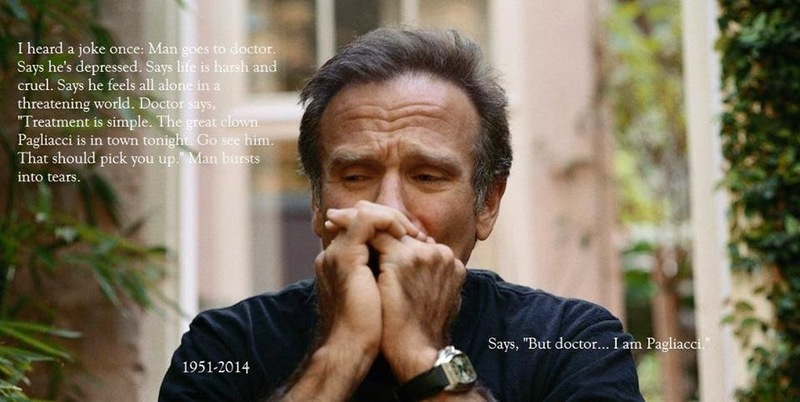 As beloved as Robin Williams was to many of us, most of us did not know him personally. And yet, we only heard about him and his death because he was famous enough to be newsworthy. What about the 40,000 other people who commit suicide in America each year? What about them? And the reality is unless they are famous or we know them personally, we aren’t going to hear about them. Speak up for those who can’t speak for themselves. So I’m writing today on behalf of one who’s voice was not heard. At least not by those that may have been able to help. Shortly before Robin Williams took his own life, my next door neighbor did as well. However, unlike Robin Williams, most of the world didn’t know anything about her. Only a small handful of people that she has left behind. On a more personal note, this woman wasn’t just my next door neighbor. She was also a relative by marriage. We had known each other for a decade and when I moved here, little did either of us know we would eventually be related! Naturally, the news was shocking when I found out. I had just spoken to her not too long before she died and in that conversation, nothing gave me any indication that she was suicidal. In fact, much of our conversation revolved around health and fitness and her expressing a desire to want to get back in shape. Generally not a sign that a person was in despair and feeling hopeless. Only after making contact with my neighbor’s daughter, who no longer lived at home, did I realize just how little I really knew about her and her circumstances. Although I had known general information that she had struggled with depression and anxiety, I didn’t know how severe it was. I learned from her daughter that there had been a suicide attempt a couple of years prior when she still lived at home. And no one else knew a thing about it. Not even extended family members. And the daughter had been conditioned to not share secrets about the family because it’s private business. What happens when people reach out for help and are shamed back into silence? I learned from the daughter that her mom really did try and get help. She was seeing a counselor when she attempted suicide the first time. This episode appeared to have been brought on in a period of intense overwhelm while caring for her dying mother who had cancer. Instead of getting the help she needed, the therapist she was seeing dropped her as a client because, apparently, the manner in which she tried to kill herself was too disturbing. So she slipped through the cracks of the system and was left without any help at all. Including her only child who was in high school at the time. And that meant her only daughter had to cope with this all by herself as well. I don’t want to dwell on the manner in which she took her life, however, I will say she did leave a brief note. She had given up all hope. When all hope is gone, people look for a way out. And here I lived right next door without any knowledge whatsoever that she was feeling hopeless. The sad reality is that I could and would have been there for her if I had known that she was in need. I can’t tell you how many tears I’ve shed over this. Or how many times I’ve replayed the last conversation we had together in my head. Or how much I’ve wondered what I could have done or said different that could have possibly altered such a fatal course in this woman’s life. And yet, as I know only too well from all the grieving over the loss of my husband, none of it has the power to bring her back. At some point, either someone you know is going to deal with someone who has at least attempted or committed suicide, or you will have to face it directly with someone you know and love. I don’t have the cure for suicide right now except for the all too generic cure called LOVE… so I’d like to offer something in the way of an honest and practical contribution based on my own experience going through it (two months now after the event) and an invitation to have a conversation about it. If not with me, with yourselves and with those you love. We cannot heal what we still are too afraid to talk about. So this is my way of wanting to help make uncomfortable feelings of pain and sadness easier to talk about so that we can learn to ease the suffering in the world. Or at least in our own tiny corners of it. As with any death, survivors are going to go through the grief cycle. 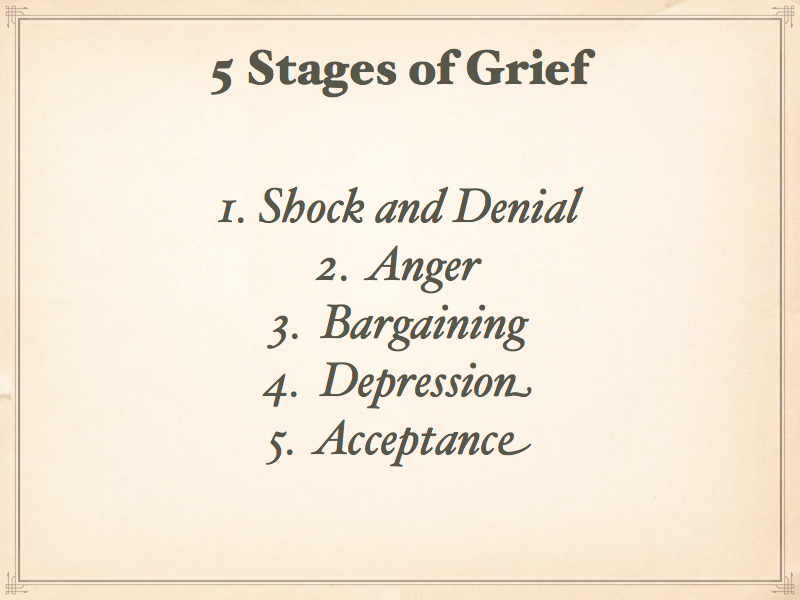 For those of you who may be unfamiliar with it, there are five stages to loss and grief. People will cycle through any number of them and in some cases several times through the grieving process. It is most common for people to experience denial or shock when first learning of the death of a friend or loved one. It took a few days before the full impact of my neighbors suicide really hit me. I had been caught up in my own life and tackling things that had been put off. I had even repainted most of the walls in my place while my daughter was on vacation visiting her grandmother. I felt like I had a new lease on life with some grand new goals I was implementing and feeling the momentum slowly build. Then ever so slowly, as the full impact of the suicide crept deep into my bones, I felt the wind begin to slowly let out of my sails. My own fledgling hope began to flounder, in danger of being entirely snuffed out. I was caught in the midst of another grief cycle and one that I wholeheartedly did not want to be in. I started skipping meals because I wasn’t hungry. I was crying at the drop of a hat. I felt displaced from my surroundings and out of step with the world. I’d get online in hope of connecting with those I had developed a close affinity for, and simultaneously, as is the nature of the internet, I’d get bombarded with all sorts of unhelpful messages and cliches, more then ample doses of shame that can be absolutely lethal if you are trying to keep hope alive. Difficult to keep the bad out while clinging to some good for encouragement and support. And naturally, I found the all too common message loud and clear. ‘If you’re unhappy, we don’t want to hear about it. And countless other messages from all corners of the internet world from people who don’t really know what they are talking about. One giant toxic shame dump. And yet even though I consider myself to be spiritual and no longer religious, I would hear those old familiar words in my mind, ‘Father, forgive them for they do not know what they do.’ ~Luke 23:24 Yet with not enough power to ease the pain in my own heart or soothe my bruised soul. Then after reading so many mixed messages day in and day out, I couldn’t help but understand why America is experiencing over 40,000 suicides a year. Unless you can pretend to be happy and put a smile on your face, it’s just not safe to talk about! And I’m here to tell you that unless we START talking about it, statistics aren’t going to improve. Naturally, part of my own grief process has been in a quite emotional struggle in trying to make sense of it all. I had shared with a Twitter friend recently, Alli Polin, and said that I feel like I’m having to search for the needle of truth in a haystack of mixed beliefs on this one! Oftentimes, it’s not until we are in the midst of an experience, do we come face to face with what we have learned to believe. And this happens whether we like it or not; whether we want it to happen or not. And believe me when I say I’d rather being doing anything else but dealing with suicide, thoughts on suicide, death, grief, and loss. Struggling over possible ways the suicide could have been prevented. Replaying our last conversation (and history) over and over again in my mind to look for some sign that I missed…for something that I could have said or done differently. More aware of just how important it is for people to feel connected and have a sense of belonging. I wondered about some of the things I’ve heard online about people criticizing the deceased and calling them selfish. After much thought, I have come to the conclusion that it might be just as selfish to desire people who are living in a personal hell and emotional torture to have to live that way day in and day out without any help or relief. People end their lives because they can’t take the pain anymore, not because they are on a thrill seeking quest or adventure! I’m reminded that we really don’t know what we don’t know about each other. Fortunately, the daughter told me that her mom only showed me what she wanted me to see. She didn’t think there was anything more that I could have done based on the knowledge I had over the years. How can we make it safe for people to talk openly and honestly about what is going on in life so they don’t have to ultimately end their lives? Wondering how we can bridge the gap for people who wind up without families or in fractured families where there is little to no support. This list by no means exhausts the topic. I’m sure I’ve missed quite a few things I’ve thought of and pondered over the last couple of months yet can’t recall at the moment. I do hope this topic is treated with some care and compassion by those who know me and considered to be an invitation to talk about these things with those you love. As you do, here are some questions for reflection that you might want to consider. When you struggle with painful feelings, who can you turn to when they become difficult to handle? Do you have anyone at all that you can turn to? Who makes you safe enough to express your honest feelings? If you UNDERSTOOD that today could be the last day of every person you encountered, how would you choose to treat them? How much more gentle, loving, and kind would you be? If someone comes to you with suicidal feelings, do you know how to handle it responsibly and with compassion? If not, what can you do to learn some basics so you are prepared? What other questions would you add to the list? Comment below and I’ll add them to this post. In Comes the Storm by Samantha Hall – My account of the day my husband died. The beginning stages of grief and loss. Thank you, Samantha. Important thoughts well crafted. Thanks David. I”m honored that you stopped by! 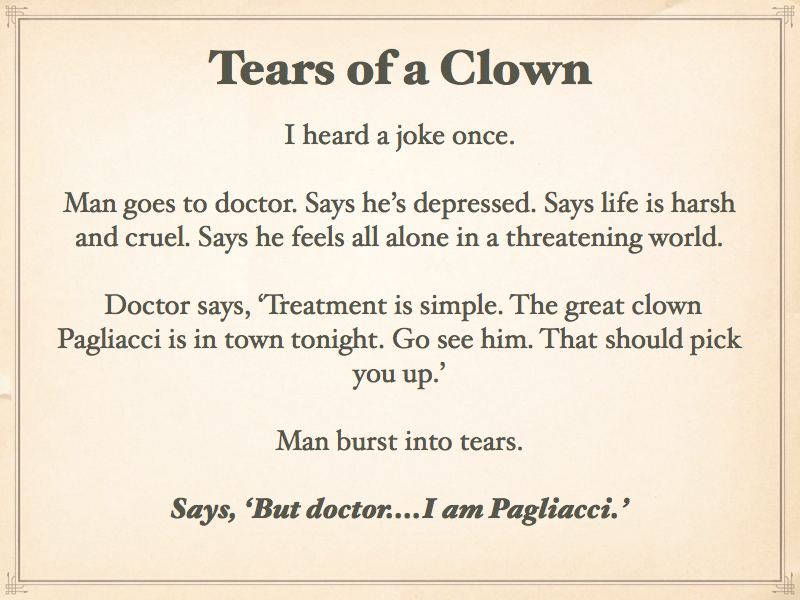 I also have you to thank for the pagliacci image as well. Touching image and story. I just want to first say, how much I admire your writing this post, sharing your pain and sense of helplessness in the face of something few of us can understand. After years of studying psychology, my own therapy and many years of being a student of human behavior, I am humbled to repeat what you said in the post, “We don’t know, what we don’t know.” What is quite amazing is how many people act as if they do know what is in people’s minds and hearts. Maybe that is why I have chosen to talk about emotions, especially anger and fear in the course of my work. In my attempts to understand these complex feelings, I have seen people struggle terribly to “resolve” them. One of the basic beliefs I have come to working with my own feelings and trying to understand those of others is echoed in another point you made, – we can’t heal what we are afraid to talk about. This, I fear, is pandemic within many cultures. Emotional repression in this culture and others is very real – it’s insidious and takes many forms. Emotional suppression is learned early and in my experience, reinforced through dozens of cultural norms. The sense that we are bearing our emotional burdens alone (I think much of trauma is this) is widespread. Unless we learn to “tolerate” conversations about what we feel in open and blame based ways, we will keep forcing people into the shadows. Thanks for writing this important piece. I hope it reaches a wide audience. Honored by your comment Louise. Thank you so much. My sentiments exactly on this. I totally agree. This is why I can be quite bold when it comes to addressing leadership at times. It’s one thing to deal with the average lay persons ignorance. Quite another when that ignorance comes from leaders who have a great deal of influence. They can do way more damage. So it’s important that even if we lead from the middle or the bottom, we do our best to speak truth to leadership because that’s how we can help our leaders stay on the path (or get on the path) and we help protect the majority. Pretending they know is a grievous error. Generally filled with minimization. Now I know why I’m attracted to your own blog posts and work! : ) You intentionally focus on the same subjects that i feel are critical and need to be openly discussed; namely those difficult feelings called anger and fear. The no talk rule IS pandemic in society. In fact, as I’m sure you already know, it is the hallmark of dysfunctional families. Not being allowed to talk about what matters is what keeps dysfunction going. And in order to keep dysfunctional systems going, one is required to disconnect from their own feelings in order to cope. Detachment. Yes. VERY real. If we pretend everything is ok, that is easily digested and the cultural and societal numbing continues. Start to talk about difficult feelings and many people scatter in fear. And yes, what makes a great deal of this more traumatic is having to bear our emotional burdens alone. This was what I struggle with when it came to sexual abuse as a child and even after I told. It is also the same struggle I had after my husband died. Which only served to delay my grief process. Thank you so much for opening up so many points of discussion. I”m sure my readers will find a great deal of value in what you shared. Samantha, your writing reflects the courage to be authentic and talk about what needs to be talked about. This post really moved me. My best friend killed himself a year or so after we graduated from high school. In my profession I talk deeply with dozens of troubled and suicidal young people…..but nothing has broken my heart more than my friend’s suicide. Thank you for sharing your wisdom and compassion regarding this tragic underbelly in our communities. Thank you so much Steve. I’m happy this post resonates with you and it is my hope that it can help bring much discussion and healing for any of us who have been touched by suicide in some form or another. I’m so sorry you had to experience losing your friend Steve. Honored that you would share with us here. May your own sensitive heart and experience over the loss of your friend continue to be a wellspring of compassion for the dozens of troubled and suicidal young people you encounter in your profession. Not sure I have the words for powerful, transparent, authentic post. Loss is never easy. Unnecessary loss is even more difficult to understand and accept. There is a song named Why? By Rascal Flatts that I have listen to many times over the last sixth months while questioned my unemployment and my future. Part of asks “Why would you leave the stage in the middle of a song?” I decided leaving the stage was not option. And people like yourself helped me with that decision. Unfortunately others answer the question a different way. I am so sorry for your loss. Your strength and commitment to life is inspiring. Thanks so much for stopping by and sharing Tom. I always appreciate it when you do. The lyrics from the song you shared reminded me of a poem by Walt Whitman called O Me! O Life! Ironically, I first heard it spoken from the lips of Robin Williams in the movie Dead Poet Society! What really strikes me is how loudly we do hear to dump all of the toxic negative people in our lives. Push them out. Room for positive only here. When that toxic person may be struggling with demons that are far beyond our understanding who is that helping? How is that caring? Is that who I want to be? I don’t think we need to spend all of our time with people that are negative or always down in the dumps but I do think that our actions send a message that matters. I would hate to think that someone who annoyed me was actually trying to connect with me the only way they know how. There are no easy answers around suicide and it’s in the aftermath that we try to make sense of things yet the one person we need to ask and desperately want to help is gone. Thank you for so bravely tackling this topic that so often remains hush hush. Positivity is great but it doesn’t erase the pain that so many face on a daily basis. Thank you so much for your insightful response Alli. Here’s something else I’ve thought of over the past couple of months…even if my neighbor HAD opened up and shared the true depth of her own suffering, it may have been too much for me to help her with all on my own. Yet I’m also reminded of the story of the Good Samaritan. The few points that I remember standing out the most to me is that 1) he didn’t ignore the situation 2) he gave what he COULD and let someone else help with the rest. Perhaps we become more fearful if we think we have to help people all on our own. We over complicate much of it to the point little help happens at all. Basically, when someone has injured a part of their body, as long as they are in pain, there will be suffering. Once they are healed, they aren’t suffering anymore. It’s similar to other areas of suffering. People without shelter suffer until they have shelter. Starving people suffer until they have food. The lonely person suffers until they belong (and are accepted) in a group or tribe. The unloved suffers until they are loved. Thanks for inspiring my noggin with your wonderful and insightful comment and for taking the time to read and share. I highly value your contributions, insights and experience. As always, your writing moves me and your generosity of spirit does you great credit. I am particularly touched by this article because 2 years ago, nearly to the day, I lost a best friend by his own hand – and I never saw it coming, despite retrospective 20:20 signs. And, being really honest, I have done more than contemplate the same end, many years ago. In my case, fortunately, it was an inarticulate cry for help and despite my incoherence, the love of others helped me though. So it’s a personal and painful topic for me, and one that I try to read about – not for ghoulish reasons,but to learn more about how to offer similar support as I received. And also to remove the stigma about discussing this, as you are doing. Two resources have helped me, and if you are not aware of them I commend them to you and to anyone else who is moved to further investigation by your article. Finally, and only this week, I came across these paragraphs (look for ON GRIEF) Jeff Fosters amazing site http://www.lifewithoutacentre.com. These are very profound words about something so deeply human universal, something we have all experienced, and may well experience again, if we are not yet numb to life. When a loved one leaves you, or an unexpected diagnosis comes, or a relationship ends, or we experience some kind of deep shock or loss, we can be ‘rudely awakened’ from our slumber, shaken by that dear old familiar friend, grief. “This was not in the plan!”, we think to ourselves. It feels like life has gone ‘wrong’ somehow, that the universe has been knocked off course, that “my life” is perhaps over and recovery is impossible. But what has really happened, friends, but the loss of a dream? What has really died, but our seemingly-solid plans for the future? We dreamt of walking off into the sunset with each other, we dreamt of all the things we were going to do together, all the fun we were going to have, all the things we would accomplish. We were living for so long with those dreams, those plans, those expectations, that we forgot they were only our dreams we were holding onto, and we took them to be the reality of “my life”. Now that the dream has crumbled, what is left? But these movie-futures were “never going to happen anyway”. It’s not that our plans were going to come true, and then they were ruined by our incompetence or bad luck, it’s that they were never going to happen anyway. (Why? Because they didn’t. That’s reality, however much we would like to argue with it.) That is a huge difference. That is the difference between despair and deep suffering, and total liberation. It’s the difference between the irreversible loss of something that was “mine”, and the realisation that what was “mine” was never mine at all. Going deeper, we see that in the experience of loss, our own identity that is being threatened. When ‘father’ dies, what happens to my identity as ‘son’? When ‘girlfriend’ leaves me, and I have been identified as ‘boyfriend’ for so long, who the hell am I? When the diagnosis seems to stop me from being ‘athlete’ or ‘doctor’ or ‘singer’ or even ‘seeker’, and that’s all I’ve ever known myself as, it’s like a death. The death of the image of myself. We are literally grieving over our own lost identities, lost images. It feels like we are grieving over something or someone ‘out there’, but really, the death is much closer and more intimate. And life’s invitation is this: Stay with that internal death. Stay with the mess, as I often say. Do not make a single movement away from present experience. There may be gold hidden there, and you will never know if you try to move away. Stay close to the grief, to the universal pain of loss, so that it doesn’t solidify into bitterness and depression, into a belief about how terrible the world is, how cruel life is, into a heavy story about “my horrible loss” that you carry around with you for the rest of your days. It doesn’t have to be that way. Life itself is not cruel, for life is All. It is the loss of our dreams that feels ‘cruel’ at first. But contained within that loss is a secret invitation – to wake up from all dreams. To see the inherent perfection in all things, in all movements of life, not as a concept or fluffy belief, but as a living reality. To see that life itself never really goes wrong, for there is no goal to miss, and that even the intense grief that we feel is a movement of love, even if it doesn’t feel that way right now. It is because we love life and each so much that we feel everything so intensely. And we are vast enough to contain it all – the bliss and the pain, the joy and the grief, the plans and the destruction of those plans. Who we are is not broken, who we are is never lost, only our dreams, only our innocent hopes. And so every loss is a little invitation to wake up, to let go of those dreams that were never going to work out anyway, and to see life as it actually is. It feels like suffering and depression at first, but it is really a kind of cosmic compassion the likes of which the mind has no hope of understanding. Hello David! Thank you for such a thoughtful, heartfelt reply. I am so sorry that you lost your best friend to suicide. ((great big hug)) So you know all too well the challenges in trying to make sense of it all in the aftermath. I”m also glad that other loved ones were able to help you pull through your own darkest hour. I”m certain those experiences have served to equip you with an understanding now that you would not have had, if it weren’t for all that you went through. Yes, removing the stigma is an important step to this. On multiple levels. Thank you so much for sharing your own experience and contributing your piece to this complicated puzzle called suicide. Very thoughtful and meaningful, Samantha. I don’t have anything to add. At times, we can be empathetic and yet we don’t really make the connection. Both need to connect with empathy to develop a real connection. An openness and willingness needs to be present. Grateful for the engaging thoughts here along with the resources. This will help many make connections in more meaningful ways. Very insightful point Jon, thank you. Empathy and true connection definitely needs to be there or people tend to make things worse for the person in deep suffering. Gratitude and appreciation for you taking the time to read and share Jon. Samantha — this is an especially powerful post on a tough subject. My teacher at the time, a guy who’d been doing the work of preventing self-violence for most of his life, was quite clear that you can offer, you can support, you can try to assist in setting the limits, you can help people find the right counseling, but there is also a boundary to that work, too. Someone who truly wants to die will find a way to do so, and you cannot take that on as a personal responsibility. Suppose you had in fact known your neighbor was suicidal and you’d tried to intervene and she did it anyway? How much more guilt would be there? I’m sure you see what I am saying — the idea that somehow you could have done something differently may not at all be true. I know you as one of the most sensitive, least shaming people on the net and I trust that you exemplify this trait in person. You always seem to aim toward congruence and being who you are, disclosing and making sense of the need for disclosure, inviting trust, inviting openness and healing. But others may live very differently. We simply cannot really know another unless they let us in. I’ve heard this same dynamic, by the way, is also true of high school rampage shooters. There may well be a double-life into which no access has been granted, and you must not take it personally that the access was not given to you. You might be a parent, a relative, a close friend, and access might not be there, no matter how much you care. Of course we want to break down all of that, to be present, to be a healing presence as best we can, but it’s also a two way street, and there are, tragically, casualties. You must take care of yourself. I remember a friend in college whose younger sister hanged herself. He talked to me one day about the journey of his guilt. “Why didn’t she talk to me?” was the question that had bothered him for a long time. But of course, he learned there was no answer to that, though he felt the psychological scar as if it were a real hole in his chest, as if he was still hanging, as well. In the end, he said, he had to stop asking for that answer and learn to accept how that, too, was part of how her self-violence had wounded him. Where I see deep truth in your article is in the notion that we need to talk about the problem of suicide — just as, I think, we also need to talk about the problem of rampage. We fear the discussion, and try to create shortcuts and rationalizations and shame. We try to sweep it under the rug and hope we don’t have to face it. A great deal more practical openness needs to be present for this topic across this society. Your voice could help start the movement toward that end. I’m so honored that you’ve taken the time to share your invaluable experience with this Dan. I want to highlight the two things you mentioned in your comment: Support and Limits. On the support end of it, I really like what Thich Nhat Hanh has shared on compassion and deep listening. It’s the major component that is lacking when so often people want to start labeling right away and encouraging ostracism. When we consider someone a threat, they are going to perceive that and they aren’t going to feel safe in opening up to us. And what so often happens, the person then dumps further blame on the one already hurting because they don’t understand their own role in the problem of not being able to make the connection. As for limits, can you elaborate on that aspect in more detail? I understand about our general boundaries and things like that but specifically, in regard to dealing with someone who is suicidal, how do you mean? Yes, I’ve also learned in nursing that more often then not, the one who is serious about committing suicide will not likely be expressing or confessing their suicidal ideation. Often, the one major sign and warning would be they start giving their belongings away. I’m not surprised about the link between anger and suicide. After all, isn’t depression considered to be anger turned inward? Against oneself? Although I want to emphasize to our readers that anger is NOT the only cause of suicide. Despair is as well. And in some eastern cultures, it is not linked to anger or despair at all but to honor. Which is completely separate from what we are discussing. I only make mention of it to note that suicide is viewed very differently from our experience here in the West. I also want to emphasize what you said here because it’s important. Especially for those of us that either have been involved in or still are involved in the care taking/healthcare/mental health professions. This is such an important point. As for wanting to know if there was anything more I could have done, I hope that this is a normal part of a healthy human response of compassion/empathy. To inquire within in order to learn if there is something I could do better in my relationships. And that said, you are so right. We cannot know another unless they let us in and this was just such a case. My neighbor (who became a relative) and I were both people who enjoyed our privacy. I had lost my husband and she knew that. She expressed that she liked to keep to herself. And so perhaps we were OVERLY sensitive in wanting to ensure we didn’t invade each others space and boundaries. So although I’d reach out at times to see if she wanted to go for walks and although there were plenty of occasions where we’d catch each other outside and shoot the breeze…or she’d be gardening and share her veggies with me, etc… we simply didn’t evolve into a ‘tight’ relationship. And I believe even now, that’s what was comfortable and acceptable to both of us. Yet in the aftermath, I can’t help but wonder if she WANTED more then that when she was going through her darkest hour but felt like she would have been putting me out! I did always try to do my best to let her know if she EVER needed me for anything, I’m here. She simply never was one to take advantage and was generally overly apologetic in not wanting to put anyone out or being a burden. As for the school rampage: YES! You and I live in the same state so that’s heavy on your heart and mind as well this week! Shocking I know! I don’t even know what to think or say right now on that score. Still deeply saddened and at a complete loss over it. Thanks again for such an invaluable comment that sheds a great deal of more light on this difficult subject my friend. Honored that you have taken the time to share with all of us. And your words and insights are of help to me, personally, when it comes to this situation. As always, you’ve written a masterpiece that should be shared often and extensively. If everyone hasn’t experienced this with a friend, colleague, client or family member, they will. My first was with a co-worker who left her own life over 30 years ago. Every time I drive by the church where the services were held for her, I think of her. She always seemed so happy and humorous. It was the worst Monday morning meeting I ever attended. The only thing I would add is that leaving life in this way isn’t always intentional and immediate. Sometimes people allow themselves to deteriorate physically through various injurious habits that eventually give us an acceptable excuse for them leaving us. For example, some studies of patients with high mortality illnesses and injuries show that as many as 20% have lost a desire to continue living. They come to see this as an acceptable way to leave even if there is still some reasonable chance of trying. There are many who could use our uplifting interest (not just a note) of concern; yet, you are so right. Our positivity dogma can carry things too far. It’s one thing to feel badly and quite worse to compound it by feeling badly about feeling badly. If you aren’t happy, there is something wrong with you. This then becomes a form of self-censorship. A friend was having a nervous breakdown because of retiring. Half of what was giving her grief was that she felt badly about feeling badly. She’s retiring! What could be wrong! Even though she had to be put under observation, learning that its quite normal for people to feel anxious about retiring gave her some relief. Losing the structure work can bring to our day can be terrifying. Again, thank you for writing such a heart-felt and personal post. But again, that is always so natural for you. Of course, I’ve also heard of other cases where the people were more angry and volatile and ended their lives as a way to punish their exes who won’t take them back! So people do take their lives for a variety of reasons. As long as people don’t have to feel bad for what another person is experiencing, empathy is not needed. So we have now created this world where talking about the IDEA of having empathy is literally mistaken as having it in reality while in the next breath, people are encouraged to shun those who are considered to be ‘negative’. Even religious people have fallen for this false teaching or ‘positivity dogma’ as you put it. And that’s not to say that any of us want to constantly feel down all of the time and it IS hard when we are around it all of the time. However, it’s important to not lump everyone into one category. People who are going through legitimate issues in life are not going to feel ‘happy’. No one expects people to show up in the ER with smiles on their faces and yet we treat other areas of our life with that expectation. Just because we can’t see visible blood and broken bones doesn’t mean that person isn’t hurt and bleeding inside. The positivity movement is actually serving in training people how to deaden their empathy. It prevents it from happening. That’s the opposite of what humanity needs. So sorry for tardy replies. My work schedule has been heavier than usual. You asked about limits, so let me share a few further thoughts. There are many kinds applicable to suicidal people. A man in his fifties (an especially hazardous time for men) might very well show up at the suicide clinic carrying the gun(s) he intended to use. The teacher/practioner I mentioned in my comment above was very clear about the limit: the guns had to be put down, couldn’t come in to the room where he and the client would talk. Similarly, a limit is set when you ask a person to flush the sleeping pills she was thinking of taking that night. These are very clear lines. But there are other, less immediate physical actions — like talking about the impact of a suicidal person’s death on others, what that might do to a son or daughter of the client in the future. Thinking about consequences in this way also begins to implicitly sets a limit. Sorry I don’t have more time to expand on all this, but hopefully, this will be enough! No apologies needed my friend. Thank you for taking the time out of your busy schedule to include these additional details on limits and boundaries when dealing with someone contemplating suicide. Very helpful in giving us a more well-rounded view of how vast each encounter and experience is depending on the person. Also, the addition of encouraging a person to think about the consequences is so important. Especially if the person feels that the world would be better off without them. Thanks again for your generous contributions on this topic Dan. Gratitude! Wow – great read. My daughters Orthodontist committed suicide here in Vancouver and before it happened – I did notice he was off. But I didn’t say anything yet I doubt even if I did, it would have changed anything. It was a very sad thing – a waste of a human life but I do know whatever he was feeling that made him take his own life was real to him. I will never understand it – I can only pray for the people that feel such despair. I was one of the first person they called because my daughters appointment was the next day – the office lady was crying while on the phone. I have never been deep in this hole ever and hope I never am. Hugssss Sam for sharing your feelings. Thank you for sharing Jo. How did it impact your children? I imagine that even if they didn’t feel close to him it was still disturbing because it was someone they knew…even if only at the dentist office! This is yet another example that we simply don’t know what we don’t know about people. Anyone, regardless of who they are, even if we perceive them to be financially well off or appears to ‘have it all’ does not reveal what is going on inside of a person. Incredibly powerful piece Jackie. Thanks for sharing. I’ll be sure to share it on Twitter as well. ‘Please don’t judge what you haven’t experienced. It’s no more foreign than French fries and French kisses. We are all one heartfelt hug away from each other. Excellent, and almost too thorough an article, Samantha! 1) Hopenol is critical. We (somewhat healthy) humans have a responsibility to enlighten and provide hope to those who struggle. And let’s assume we all struggle. There. Now there’s no need to cherry pick. 2) I twice failed at my own suicide as a youth. And now? Damn glad I was a failure at that. The lessons? Manifold. But the heart of it is: Finding a reason to live is the core of our being. Purpose and passion drive us humans. I believe Victor Frankl covered that in detail. We would do well to heed his advice and process. 3) My former wife used Oxycodone to end her stay on this rock, just days after her birthday, 2008. I have never cried so hard in my life. My (at the time) 12 year old son found her. I came in minutes later. Took my daughters to lunch and made sure not to mention it so they could have at least one solid meal before exposing them to the reality of the situation. 4) Did I mention hope? Yeah – that’s the difference between life and death. Robin found he had Parkinson’s. We don’t know if that was the last straw. But for someone who felt he HAD to illuminate the room, I can easily imagine that was all it took. Which leads to my most salient point: Quality of life vs Quantity of life. Last night a beautiful woman named Brittany, with Stage 4 brain cancer, died peacefully in Oregon (a right to life state). She and her family moved here just last week to do the deed. We can argue whether there is a God. And whether it’s our right or His Right to extinguish our own flame. But I am of the firm belief that quality trumps quantity. Did Brittany commit suicide? Or did she merely accelerate the inevitable, reducing the pain and loss of the long-tail decline of her health and mind, to allow her loved ones to go back to living their purpose? My mother was a Hospice worked for about 5 years. Through that experience, I had the opportunity to meet, fall in love with, and visit the graves of more than 20 women under her care. That experience helped me greatly appreciate both the kindness and depth of love my own Mother is capable of giving. But also the pain and grief of the families who watched (or evaded) their own mothers as they faded from this life to the next. Many of them would have appreciated a faster, less painful decline. Feeding tubes, brittle bones that shattered merely walking to the bathroom. Painful lesions that weeped constantly. Hope is at least one part of the cure. A few days ago I had a dream about Tish. In my dream, I sobbed as hard as I did when I had to pull the plug on her lifeless body. I have fewer of these dreams now. First monthly. Now, maybe twice a year. Last thing: At the wake in my home, a non-descript econo car pulled up and a young man got out with a beautifully wrapped box. handmade paper and a ribbon closure. I signed for it, then untied the ribbon to expose the contents inside. There was a cover letter, followed by 6 unique letters. Each written by someone who received her organs. (yes, we both checked that box on our driver’s license). My youngest, who was 10 at the time, read the stories to family and friends attending the wake. If there is silver lining to the other side of life, it is this. I wish she were still here. Until recently, whenever one of the kids did something cool, I would grab my phone to call her. I miss her voice. But I’m glad she’s out of her pain. Her demons. We need to explore suicide from every angle. It’s not a black and white, cut and dried gig. Thanks, Samantha, for covering the gamut here. I remember the day Tish died all too well and the messages you sent to me from ICU. I couldn’t believe it. Those were some extraordinarily challenging times, to be sure. Hope is definitely critical. REAL hope and not the empty kind that has no substance. Along with a sense of belonging and significant purpose in the world. I appreciate you highlighting the difference between quality versus quantity of life. One of the facilities that I worked at as a nurse had a patient that was alive, yet non-responsive and hooked up to a foley catheter and tube feedings. She had basically been left there to die and secretly, it terrified me. It’s not the way I would want to spend my life. Basically being kept alive to line pockets of the institution and yet with no other purpose. And no one who cared enough to visit either. You’ve shared so many points to ponder on this. I sincerely appreciate you taking the time to do so and also for your transparency in sharing the piece about your youth as well. Thank you for this post Samantha. It is exactly how I’ve felt for a few months as I experienced something similar recently. In searching for answers, I found the #DareToBe community, which has helped me in many ways to question, to think, and reflect more about life and how we can lead better lives. Thank you for sharing Mayra. I’m happy you found this post useful and that you also found a community to help support you on your journey. Wishing you an abundant new year filled with new learning, discovery, healing, love, and joy!